Things to know the first time you visit Rio de Janeiro, Brazil. Even when you are standing at stop that coincides with your bus, be sure to hold your hand out like you're waving a Taxi, so that they'll stop. My first experience on the ônibus was a petrifying one. I entered the bus, which immediately lunged forward and hit full-speed ahead while I was still standing on the stairs with an open door directly behind me. I gathered myself and climbed the stairs up to the landing, where the change person, or trucador, and the revolving gate awaited me. Now, before I climbed aboard, I did not know how much the ride would cost. I also did not realize that, even after the amount of 2.50 was told to me, the speed at which the bus would make turns and weave in and out of traffic would disallow me from digging through my wallet to deliver the proper change. I was horrified. There we were, zooming past the cars and taxis, pushing through red lights like the big bully 8th grader in a 3rd grade footrace. I was sure at any moment I would go flying out the front window of the bus. The trucador finally pointed towards a seat in front of the gate where I could sit and count my change. Phew! I was sitting. At that point I knew that having a change purse was crucial, and having my money out before boarding would keep me alive in the next 6 months. Even so, there are more important things than the eyes-closed-tightly, six-flags-over-deathdom feeling to understand. 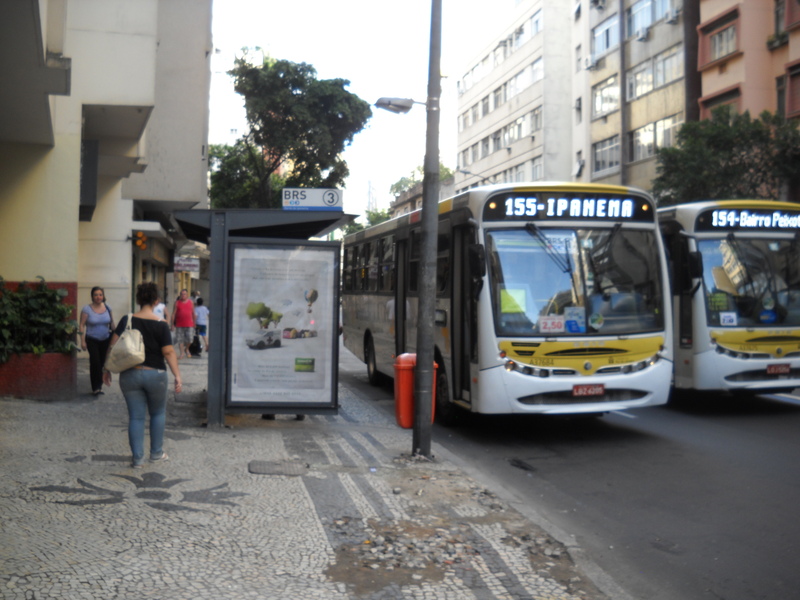 When used correctly, buses can be an effective, exciting mode of transportation in Rio. When used incorrectly, they can be expensive and dangerous. When looking for a bus, find out which numbers visit your destination of choice. So when is the right time to use the bus? Here’s the tricky part. 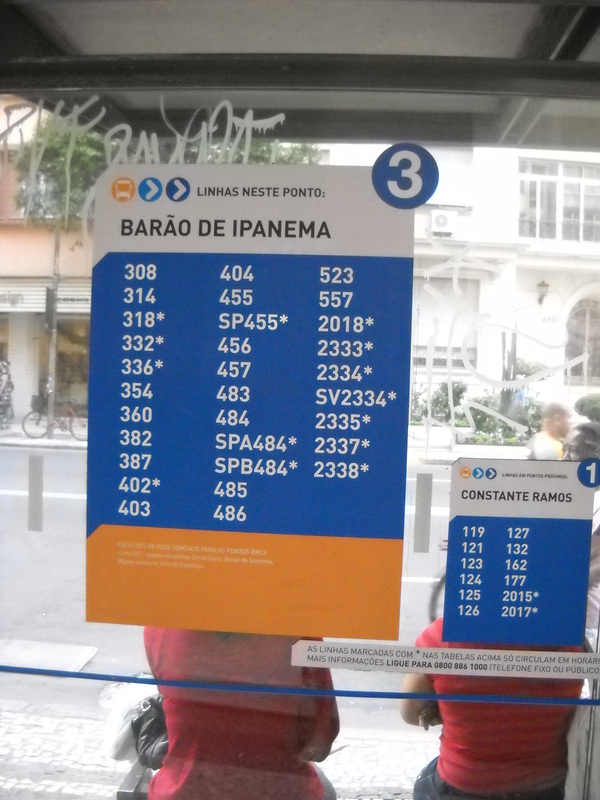 The first few days you are in Rio, finding the right bus can be very difficult, especially if you don’t speak the language. And getting on the wrong bus can send you to areas of town that are miles out of the way. However, I still say that buses are the best ways to get an idea of the layout of Rio. You begin to see the cut-offs between parts of town, you learn land marks, you see places you’d like to re-visit later. Even though traffic during business hours is a complete mess making the subway, most often, faster, I’d suggest using the bus as often as possible in your first week. To avoid spending a small fortune and arriving after the after party, however, you must study bus routes. You can do this by visiting Rio transit website or simply by stopping at the bus stop with a pen and paper when you arrive in Rio. On every visible stop, there is the number 1, 2, or 3 displayed. 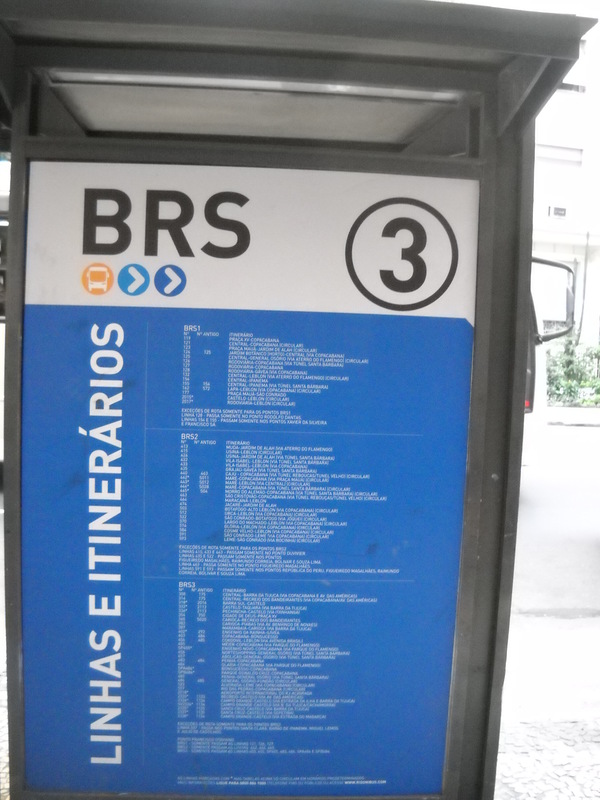 Look, then, at the bus list to be sure that your destination falls under that particular stop number. Keep in mind that some of the stops are covered and have benches, whereas others do not. Take an umbrella if it’s raining, for safety’s sake. After finding the bus number that travels to your desired location, check to be sure the bus will go by your particular bus stop. over the lack of bus stops, keep in mind there are literally 1000 lines. Stop and ask a newspaper stand, and they’ll probably point to the corner and tell you a bus picks up there. Public buses are a cheap, wonderful way to travel. Most, however, ride around with open windows and don’t include air conditioning. There are air-conditioned blue buses that you can take, for about twenty centavos more if you prefer. You can also ask the trucador to tell you when your stop is getting close. They’re great about helping tourists out. If you already have an idea of where you’re going, make sure you give yourself enough time to move towards the door. Crowded isles and a blocked exit often prevent on-site, on-time arrivals. *At night, post rush-hour, fewer buses run. Travel in groups, especially if you’re female, and always avoid the back of the bus. Homeless tend to jump on and off through the back door and ride free, day and night. *If you find yourself near someone who makes you uncomfortable, there is no shame in getting up and moving. No one will judge you. *Watch your belongings. Make sure your wallet is not in your back pocket, that your purse is closed, etc. Thieves are quick in the city. Oi os leitores! My name is Diana, and I am not from Rio. Lucky for you, I am an American who got an itch to move to Rio for six months without ever having been, previously. So on June 23, 2011, I boarded a flight with my big, bright pink bags and took off to paradise. The reason for my blog? Let`s just say there are a few things I wish I had known before I got there that I think you may find useful on your first visit. Don´t worry--the majority of this will still apply to you even if your visit is much shorter than mine. Comments are encouraged, even if you think I´m wrong about something. This is a play-by-play of my experience and advice to potential tourist to go with it. I, too, still have a lot to learn! Six months, you'll learn, is not very much time. This entry was posted in Transportation and tagged Brasil, Brazil, Bus, bus numbers, onibus, Rio, Rio de Janeiro, Transportation, travel. Bookmark the permalink. Check out a few of my other projects or follow me on Twitter for updates! Enter your email address to follow Surviving_Rio and receive notifications of new posts by email.